Goat anti Rat leptin antibody (AAR40) used to immunostain leptin expressing tissues by immunofluorescence on rabbit mammary gland sections. Leptin expression and localisation in mammary glands from C and DE rabbits at day 28 of pregnancy. (A) Expression of leptin in mammary glands at day 28 of pregnancy from control (in light grey) and exposed (DE) (in black) dams. Real-time RT-PCR was quantified using TBP housekeeping gene. Data are mean ± SEM. (B and C) Representative images of leptin immunostaining (red) of mammary gland from control (B) or exposed (C) dams at day 28 of pregnancy. Nuclei are stained in green. Scale bar represents 50μm. Impact of exposure to diesel exhaust during pregnancy on mammary gland development and milk composition in the rabbit. Goat anti Rat Leptin antibody specifically recognizes rat leptin, a major adipose-derived hormone and member of the leptin family, which plays a key role in appetite control and the regulation of energy expenditure. Leptin is a recognized marker of obesity, which signals through binding to the obesity receptor (OB-R) in the hypothalamus. Human studies have shown a correlation between circulating levels of leptin and body fat mass, and defects in leptin production result in severe obesity. Regulators of leptin expression include insulin, cortisol, cAMP and thiazolidinediones. Antiserum to rat Leptin were raised by repeated immunisation of goats with highly purified antigen. Purified IgG was prepared by affinity chromatography. After reconstitution store at +-20oC . Hue-beauvais, C. et al. 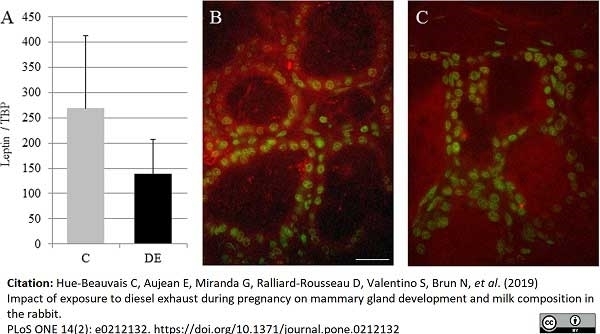 (2019) Impact of exposure to diesel exhaust during pregnancy on mammary gland development and milk composition in the rabbit. PLoS One. 14 (2): e0212132.